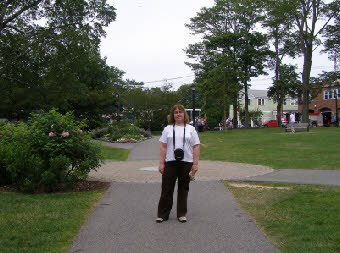 Bar Harbor is a community of 5,000 located on Mount Desert Island off the Maine coast. It is the largest community on the island and offers a variety of options for travelers. The main attraction in Bar Harbor is Acadia National Park; additionally, the downtown area is filled with restaurants, shops, art galleries, Victorian-style homes, and parks. 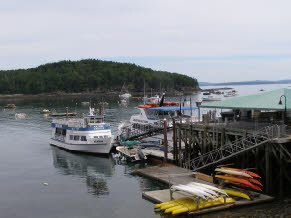 Bar Harbor does not have a pier large enough to accommodate cruise ships; therefore, passengers will be transported to and from the town by tender. 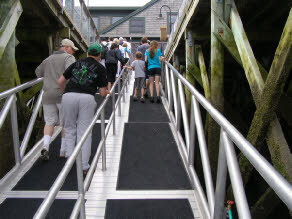 Although tendering is typically a fairly easy process, be forewarned that the ramp between the tender pier and the mainland can get quite steep depending on the tides. 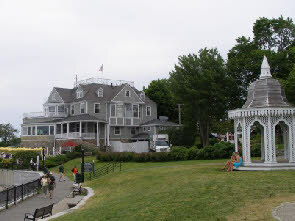 The tender pier (Town Pier) is located near the intersection of Main Street and West Street, offering convenient access to the Village Green and West Street historic areas. A visitor center is located to the right of the pier, and transportation options are to the left. Most ship-arranged tours meet in this vicinity—but please check your shore excursion ticket for the exact location. There are several ways to see the town. For the first-time visitor, a bus or trolley tour can get you acquainted with the area. There are a couple of options for this service, yet be aware that they run seasonally. I can’t comment, however, as we have not used them (yet) – but the ones of which I am aware are Oli’s Trolley and Acadia National Park Tours. Additionally, the Island Explorer runs free buses throughout Mount Desert Island between late June and early October. If you are up to it, the downtown area may be explored by foot. We generally start our walking tour by heading up Main Street, away from the tender dock, to the Village Green roughly one-third of a mile away. A right turn on Mt. Desert Street will bring you through the historic district that houses churches and a couple of museums. (Many shops are located in this area, as well.) From there, turn right on Holland Avenue and make another right onto West Street, where the wealthy made their summer homes in the 19th century. Continuing along West Street will return you to the tender pier. Total distance is approximately 1.4 miles, with plenty of places to stop along the way. Many visitors, especially first-timers, make Acadia National Park a stop while onshore. Acadia National Park consists of 35,000 acres of untouched forests, lakes, and mountains that may be explored on foot, bicycle, trolley, bus, or horse-drawn carriage. 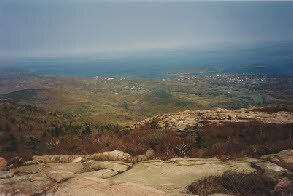 One of the key sites within the Park is Cadillac Mountain, the highest peak on the Northeastern seaboard. 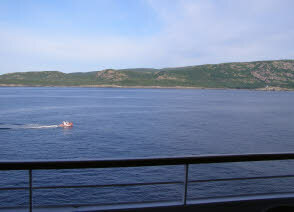 Weather permitting, you may enjoy a spectacular view of the harbor and surrounding islands. 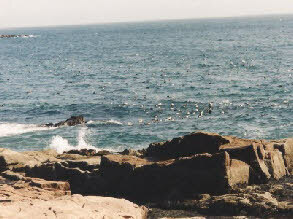 Another highlight is Thunder Hole, which demonstrates—through both sight and sound—the power of the Atlantic wave action. Don’t get too close! On our first visit, we took a three-hour bus tour along the 20-mile Park Loop, including the 3-mile trek to Cadillac Mountain, which was offered through the cruise line. We felt this was well worth it, as we had a young child with us and were not up to doing a lot of walking. 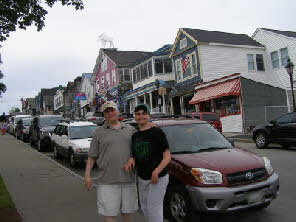 The tour also gave us a fine introduction to Bar Harbor as we drove through the neighborhoods. There are other ways to see Acadia National Park. 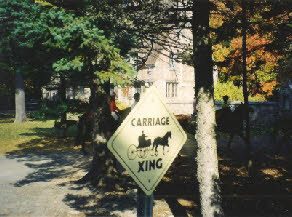 More active visitors may enjoy a hike or bicycle tour through the park. This may be done with a National Park Ranger or through an organized tour. Stop by the Park’s Visitor Center for information on the day of your visit (or, in advance, online) for a map and other essential information. Note that there is a fee (currently $5 per person) to enter the Park. Additionally, it can get cool in the higher elevations, so dress in layers and bring a windbreaker. During the late 19th century, wealthy summertime residents of Bar Harbor built so-called summer cottages—more accurately described as 50-plus-room mansions—on a few stretches of the waterfront. This transformed the once-quiet fishing town into a luxury summer destination. (This continued until the creation of a public land trust in 1901 and the establishment of a national monument in 1916 in what is now Acadia National Park.) Roughly one-half of the summer cottages were lost during the Great Depression, and half of those that remained were destroyed by the Great Fire of 1947. 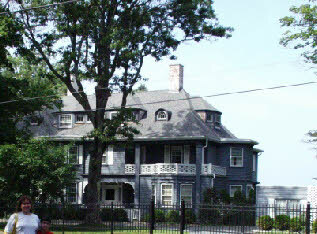 Several dozen still stand today, although they are used primarily as bed-and-breakfast accommodations. 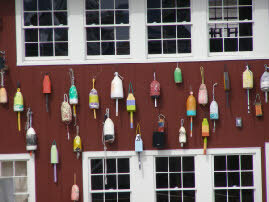 Many of these may be seen on West Street (see photos below) and Shore Path (the walkway to the right of the tender pier as you approach it from West Street). 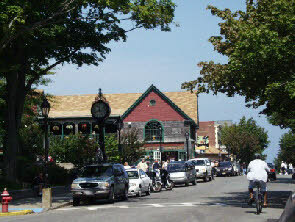 Bar Harbor’s Village Green is both vibrant and historic. This is a pretty area in which to take a rest during your stroll. The edges of the square are lined with boutiques, many of which sell items made in Maine. This is also where you can catch the public buses to bring you to other parts of the island. For our most recent visit, we chose to do something a little out of the ordinary. 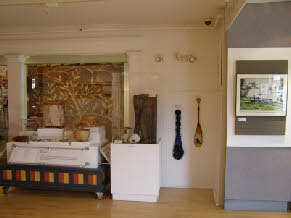 My pre-cruise research led us to the Abbe Museum, which focuses on the Wabanaki Nations who are native to this region. It’s a small museum, and good for history buffs. 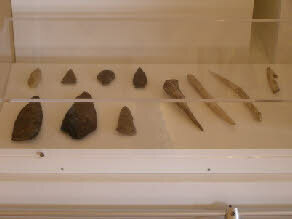 There were several exhibits, including one on artifacts, archaeological digs, art by children, and crafts. It was a nice way to spend an hour or so, which is pretty much what we had allotted as we wanted to make it an early day. As it doesn’t take much time, it’s easily combinable with other tours, such as Acadia National Park, if you desire. Its location on Mt. Desert Street is less than a block from the Village Green. There is no shortage of places to dine in Bar Harbor, whether you want a full meal or a quick bite. One place that satisfies both extremes is Testa’s. 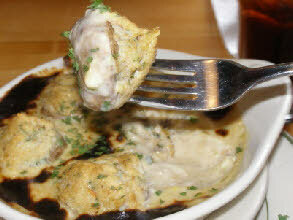 We enjoyed a superb lunch of clam chowder and crab-stuffed mushrooms during a 2011 visit. I neglected to record the name of the restaurant from our 1999 visit, and the one we patronized in 2004 has since closed. Yet, there are two ways we find restaurants on the go in Bar Harbor. One way is to ask your dining room steward for a recommendation. The second is to walk around and look for the places that are doing a good business. No matter where you choose to eat, consider the following food recommendations. (Remember, I am a New Englander.) Lobster is a must, barring any dietary restrictions. I recommend a whole lobster in order to enjoy the full experience of cracking it open to get to the succulent meat inside. This is not the so-called lobster you get on cruise ships in the Caribbean. 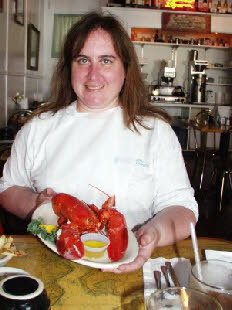 Melted butter is not needed to make an authentic Maine lobster flavorful. Chowder made with clams, cod, or other fish is also a must-have. (We eat this year-round.) Do not be dismayed if you do not enjoy fish—there are restaurants representative of a variety of cuisines. Or, you could return to your cruise ship. Yet, if you want to try lobster, this is the place to do it. Bar Harbor is a quintessential New England town that is well worth the visit. Although small in population, there are activities for everyone from the most active to those who just want to sit back and enjoy the ambiance. 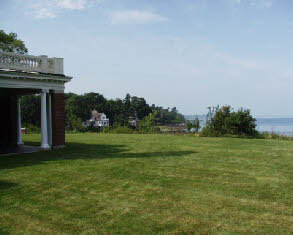 It is a wonderful spot to decompress, making it one of our favorite destinations in the northeast U.S.